Thank you for joining with us to ask Attorney General Eric Holder to intervene on behalf of the “Kettle Falls 5.” Larry and Rhonda Harvey are facing federal charges for growing 68 medical cannabis plants on their rural property in the northeast corner of Washington State. Also facing prosecution are Rhonda’s son and daughter-in-law, Rolland and Michelle Gregg, as well as Jason Zucker, a family friend. Together, the “Kettle Falls 5” face a combined 55 years in mandatory minimum prison sentences – in a state where voters have declared marijuana legal for both medical and recreational use. To date, more than $3,000,000* has been spent to bring this case to trial. Please share this petition widely if you agree that prosecutorial resources are better spent elsewhere. *To learn more about how the DOJ squanders $180,000 per day on federal interference with state-legal medical marijuana programs, check out ASA’s informational report to Congress: “What’s the Cost? 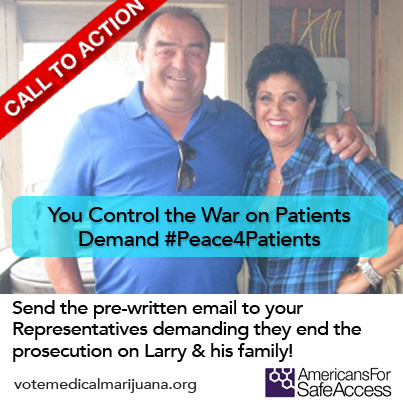 The Federal War on Patients” or consider getting involved in our Peace 4 Patients Campaign. We, the undersigned, respectfully request that you intervene to stop the wasteful and unnecessary prosecution in the case of United States vs. Harvey et al. As you are likely aware, the indictment against the Harvey family has become the focus of international scrutiny in recent weeks, due in large part to extensive news coverage. Based upon all of these DOJ memos on marijuana enforcement, the Harvey family falls squarely outside the boundaries of federal priorities. They are individual patients who were growing medical cannabis strictly for personal use. There was no commercial activity or sales of any sort, nor do your prosecutors allege that marijuana was distributed to minors. The Harveys were not involved in any criminal enterprise and there were no large sums of money to funnel to gangs, drug cartels or anyone else. Just the opposite, less than $1,000 in cash was found at the Harvey home. If the standards set forth in the aforementioned DOJ memos had been applied, the Harvey case should have been dismissed long ago. Yet, the DOJ has chosen to pursue indictment in spite of the low federal priority it represents, and the refusal by local prosecutors to charge the defendants under state law. To make matters worse, and further contradictory to your laudable criminal justice reform goals, federal prosecutors are aggressively seeking lengthy mandatory minimum sentences in this case. The Kettle Falls 5 face a combined 55 years in prison for medical marijuana -- in a state that will soon allow cannabis distribution on a never-before-seen scale. Further illustrating the point, U.S. Attorney Michael Ormsby works and lives in a county where 18 retailers have been given state licenses that explicitly allow them to sell recreational marijuana to any customer 21 years of age. Similarly, the City of Spokane, where the Harvey family is set to stand trial, recently passed an ordinance to establish a groundbreaking licensing program for aspiring medical marijuana entrepreneurs, as well as those planning to enter the emerging recreational marketplace. How can these conflicting realities co-exist? In addition, President Obama’s recent call for clemency applicants must play a factor in the Harvey prosecution. If the goal is to greatly reduce the number of non-violent drug offenders in federal prison, Mr. Ormbsy’s actions make little sense. Prosecuting the Harveys while expanding calls for clemency only makes the waste of resources more profound. What’s the point of releasing existing prisoners, only to fill the empty beds with the likes of Larry and Rhonda Harvey? In conclusion, we ask you to strongly consider whether the Harvey prosecution truly advances the cause of justice or the plainly stated priorities of the DOJ. We urge you to provide guidance to Mr. Ormsby and encourage him to find a more appropriate resolution to the Harvey case.